Applications to fill any remaining spots are due May 30 and June 30, 2008. 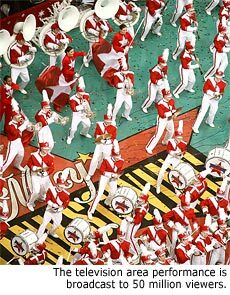 Now in its third year, the Macy's Great American Marching Band will return in 2008 for the 82nd annual Macy's Thanksgiving Day Parade. The rolling admission deadlines are May 30 and June 30 for students who would like to apply to perform in the band. 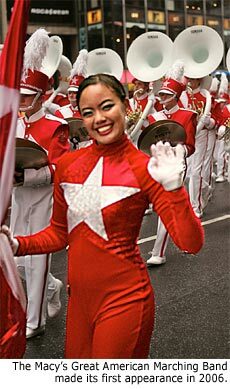 The 2008 Macy's Great American Marching Band will comprise select students from all 50 states and the District of Columbia. Positions are open for brass, woodwinds, percussion, flag and dance. The band's directors will be Dr. Jon Woods from Ohio State University and Dr. Richard Good from Auburn University. The 200+ musicians will be complemented by approximately 50 flags and dancers choreographed by Greg Lagola of the nine-time DCI World Champions The Cadets. Uniforms for the band are created and supplied by The Band Hall. Percussion and brass instruments for the 2008 band will be provided by Jupiter Instrument Company and Mapex. Travel arrangements and logistics are being handled by Music Festivals of Reading, Pennsylvania. Marching bands have long been an important part of the Macy's Thanksgiving Day Parade, according to Executive Producer Robin Hall. "Our organization takes great pride in our band program, which for decades has been a creative cornerstone of what has become America's most famous parade," Hall says. "Macy's Parade is legendary for its rigid standards and its highly competitive selection process." The 2008 parade will feature a dozen top marching bands. Macy's Great American Marching Band will have the honor of escorting Santa Claus into Herald Square to conclude the parade filled with its trademark gigantic helium balloons and floats carrying celebrities. An estimated 2.5 million spectators view the parade along the route with another 50 million TV viewers watching the live broadcast on NBC. Students selected to perform in Macy's Great American Marching Band will be in New York City from November 22-28 for rehearsals and sightseeing. The parade is held on Thursday, November 27, 2008. For more information and an application form, visit MusFestivals.com.